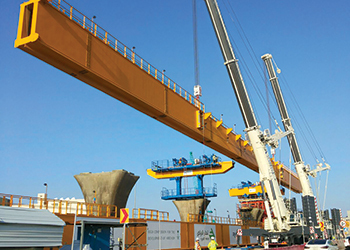 The Terex AC 500-2 cranes with compact base on the Riyadh Metro project ... easier to position. The BACS consortium, one of the contracting groups working on the metro project, hired the company to raise the 142-tonne beams and supporting winch 16.75 m in the air using two Terex AC 500-2 all-terrain cranes. The Saudi capital city is witnessing the construction of the 176-km Riyadh Metro, one of the world’s largest infrastructure projects, as part of the King Abdulaziz Public Transport Project. Planning for the $22.5-billion project started in 2013 when the BACS consortium, comprising Bechtel, Almabani General Contractors, Consolidated Contractors Company and Siemens, was awarded the contract for the design and build of lines One and Two of the project. To meet the aggressive timeline of completing construction by the end of 2018, the BACS consortium enlisted the expertise of subcontractors on the project. One such company is Mohammad Abdullah Al Areedh, which is specialised in lifting solutions and heavy equipment operations. The launching gantry lifts required roads to be closed, creating the need for urgency on this part of the massive construction project. One of the more challenging aspects of the job was the tight set-up and working conditions. “Our crew was working in the middle of the road, so there was very little room for cranes and operators to manoeuvre,” says Alrasheed. 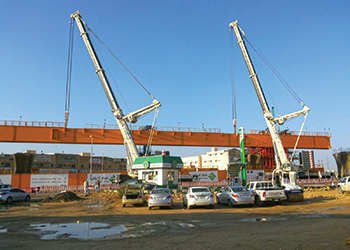 Riyadh Metro ... two Terex AC 500-2s lift 142-tonne beams. “That was one of the reasons we selected the Terex AC 500-2 cranes from our fleet. That particular model has a compact base, which made it easier to position than some of the other cranes in our fleet,” he adds. The cranes were configured to a boom length of 37.9 m and outfitted with 180 tonnes of counterweight. Each crane was also equipped with the Terex Sideway Superlift (SSL) telescopic boom attachment. To secure the beams to the supporting bases, the cranes worked in tandem to lift each beam 16.75 m at a radius of 16 m and 18 m, respectively. The weight of the beams was evenly distributed and each crane was responsible for 71 tonnes. It took the Mohammad Abdullah Al Areedh crew of seven just 10 days to complete the project. The BACS consortium was pleased with the outcome and crew’s professionalism. The Terex AC 500-2 cranes used on the Riyadh Metro project is part of Mohammad Abdullah Al Areedh’s extensive line of all-terrain cranes. With a carrier length of just 17.1 m, the crane is the most compact eight-axle crane in its class, says a spokesman for Terex Cranes. It has an impressive system length of 145.8 m through the use of the unit’s luffing fly jib. The crane offers enormous power across the full lifting capacity range because of the design of the main boom cross-section and the reinforced SSL. Short set-up times and the IC-1 control system’s ease of use make for smooth crane operations and comfortable working conditions. The drive design of the crane provides outstanding transfer of engine power, yielding excellent performance on both the highway and the jobsite, the spokesman adds. Mohammad Abdullah Al Areedh has been showing its trust in Terex Cranes, with three AC 500-2 and two AC 700 purchased in 2015, as well as seven AC 100/4 purchased in 2014. Since 1976, the company has expanded to include seven locations and employ more than 2,000 people. Al Areedh believes that its knowledgeable crew and record of on-time project completion has helped the company grow to the size it is today. Another important company philosophy is providing customers with the latest equipment models. Terex Corporation is a lifting and material handling solutions company reporting in five business segments – aerial work platforms, construction, cranes, material handling and port solutions, and materials processing. It manufactures a broad range of equipment serving customers in various industries, including the construction, infrastructure, manufacturing, shipping, transportation, refining, energy, utility, quarrying and mining industries.